WCS recently transported the custom rowing craft for Paul Ridley and his cause. Good luck Paul! (CNN) — After almost 3,000 miles of rowing, bouts of seasickness, equipment failure and salt sores, Paul Ridley is back on land. Paul Ridley trained for months before embarking on his solo rowing trip across the Atlantic Ocean. On day 88, Ridley, 25, completed his solo rowing trip across the Atlantic Ocean, becoming the youngest American ever to do so. “I’m exhausted. Overwhelmed with all the excitement from my arrival,” Ridley told CNN. For nearly three months, Ridley has been rowing up to twelve hours a day on the 2,950-mile journey to raise cancer awareness and hopefully raise money for cancer research. 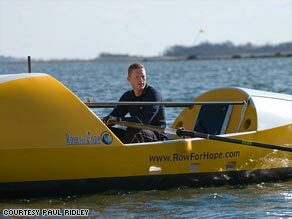 His organization “Row for Hope” was inspired by the death of his mother from skin cancer in 2001. He set out from the Canary Islands off the north African coast in his 19-foot boat on January 1; he landed on the Caribbean island of Antigua at 2:30 p.m. on March 29.